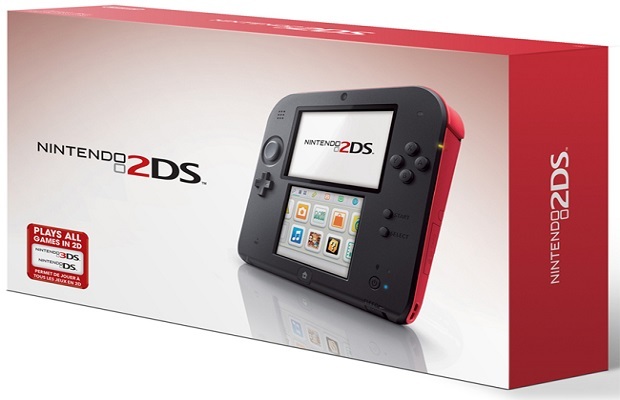 Nintendo announced the Nintendo 2DS today. Capable of playing all DS and 3DS games, the Nintendo 2DS will retail for $129.99, a full $40 cheaper than the original 3DS and $70 cheaper than the 3DS XL. It will be released on October 12, the same day as Pokemon X/Y, the first Pokemon game for the Nintendo 3DS family of systems. The biggest difference between the 2DS and its predecessors is that it does not have the ability to display stereoscopic 3D images on the top screen. Interestingly, while the 2DS doesn’t display stereoscopic 3D images, it still has cameras on the back for AR games and on the front, as well. Pictures taken with the forward-facing cameras will still be taken in 3D, but must be transferred to a stereoscopic 3D-compatible device to view them as such. The ability to collapse/fold close the system has also been removed. This is the first Nintendo handheld system that has not featured the folding form-factor since the Game Boy Micro. The system still supports all of the other features of the 3DS and 3DS XL, such as Wi-FI, local multiplayer, eShop downloads, etc. The system will be available in red and blue and will include a 4GB SD card and uses the same power source as the 3DS and DSi. Nintendo 2DS only has one speaker that plays mono sound, but full stereo playback can be done through the use of headphones. According to Fils-Aime, the 2DS is aimed at players younger than age seven, since the 3DS is for those ages seven and older. Kotaku also has some hands-on-impressions with the system. While this certainly comes as a surprise to most, it doesn’t make it any less real. Please, share your thoughts on the Nintendo 2DS in the comments below or follow us on Twitter and like us on Facebook.